Krom Lek - "Collective Conscious"
The latest from UK space festie greats Krom Lek is a collection of tunes recorded between what they call the magically mushroom seasoned years of 1985-1995. This is the fourth release I've heard from the band and I just can't rave enough about these guys. 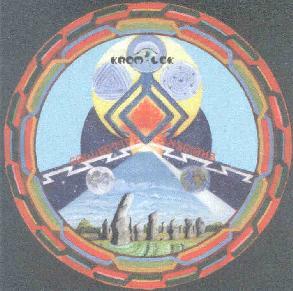 In a nutshell, Krom Lek is absolutely guaranteed to appeal to Ozric Tentacles and Gong fans, and I even hear shades of Hawkwind creeping through on Collective Conscious. Tracks like "Krom Lek", "Picking Rooms", "Earth Of Illusion", and "Earth Jam" are among the band's heaviest Ozrics styled rocking tunes. Ripping guitars, flutes, rushing synths, and speedway rhythms keep the rocketship breaking the sound barrier. And "Earth Jam" is my hands down favorite track of the set. Killer jamming space rock that piles it on thick and heavy and trips wildly. Gorgeous!! "Secrets Of The Maze" and "Step In Time" are two that remind me of Gong at their heaviest and spaciest, the former. "Merfolk" and "Earth Energies" feature a punk-ish Hawkwind sound. And "Collective Conscious", "The Sun Shines Through", and "Day Tuna Part 2" are all on the trippier side, featuring Indian ragas with flutes, droning didgeridoo, tablas, and chants. Day Tuna is even a little different taking it's trip to the west for a more Caribbean feel. In short, a great through-the-years collection and certainly an excellent starting point if you haven't checked out this wonderful band yet. For more information you can visit the Stone Premonitions web site at: http://www.stoneprem.co.uk.